The data is gathered by the DA14583, processed and transferred over Bluetooth Low Energy to the application running on the smartphone. Using the ‘Scan’ button the application scans for Bluetooth devices in the area. Once a device is found, the name and RSSI value of the device and a connect button is shown. After a certain period the app stops scanning to save the phone’s battery. Once the phone is connected to the sensor a list of available sensors is shown. Clicking one of the sensors opens a graphical view as seen below. Data is automatically updated every time new sensor data is available. Via the settings menu the sensor can be configured. The settings menu is split up in three parts: sensor configuration, calibration and sensor fusion settings. Changes in the settings are automatically stored in the sensor and can also be stored in flash memory. A ‘Reset to default’ button restores all settings of the sensor to default. The directory DA14583 contains the binaries for the Dialog IoT Sensor. You can also find these files on Dialog’s customer support site. You must use the SFL firmware for this app to function! This example works with an Dialog IoT Sensor. Visit dialog-semiconductor.com for further details. Turn on the Dialog IoT Sensor (make sure to use the SFL firmware). Make sure the blue LED is blinking (advertising mode). The app automatically starts scanning for IoT Sensor’s in the area. Click ‘CONNECT’ next to the IoT Sensor SFL to connect to the sensor. 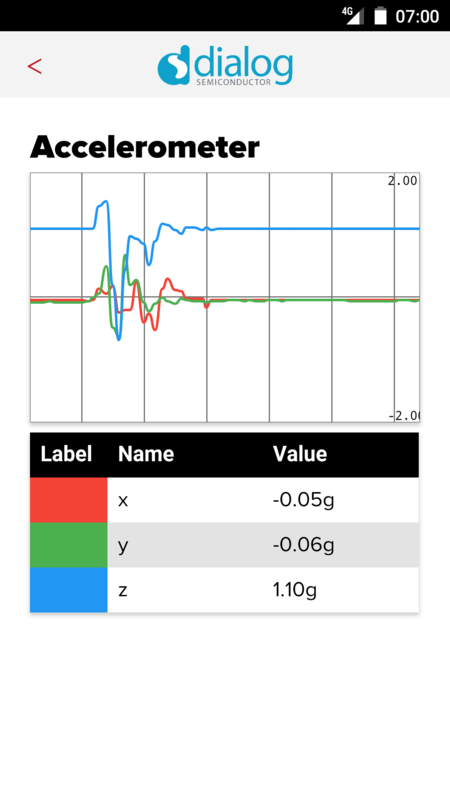 Click one of the sensors to read the data of the sensor and display the data graphically. Use the ‘SETTINGS’ button to fully control your Dialog IoT Sensor. You can reset, change or store the settings in the flash memory of the IoT Sensor.